This is the favorite area of my web sites for some. It is where you can see what I am working on and some of my favorite recipes. I will list the recipes and sometimes I may have a recipe that I am working on and may need input from you. Try a recipe today.. Not all are from my books. some are tried and true and some are new creations! Come back often for new recipes and ideas! Every recipe has a picture on the .pdf. Just click on and enjoy! Pumpkin Chip Cookies: Autumn is here! Gingersnap Cookies: Perfection in a cookie! Chocolate Pecan Caramels: Rich and nutty easy to make! 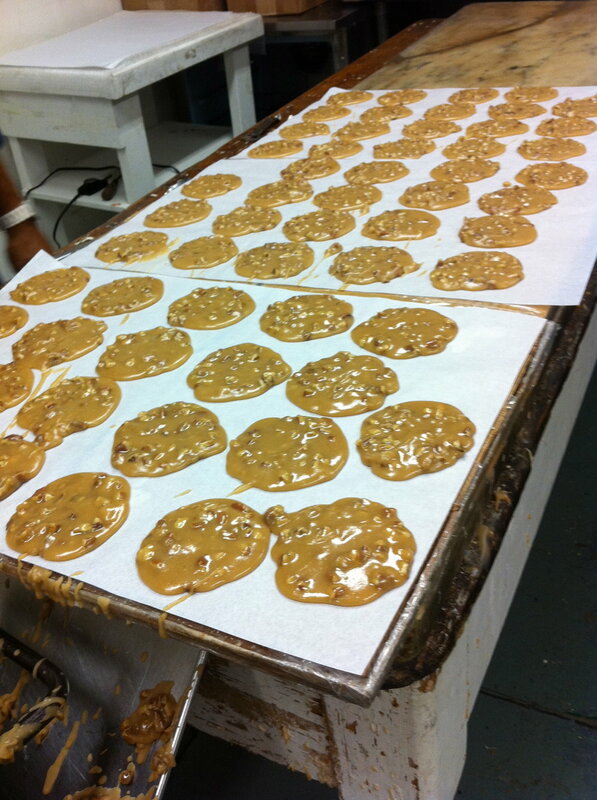 New Orleans Pralines: Creamy and you will think you are in the “Big Easy” Join me on a tour of the food and fun of this flavorful city! Quadruple Chocolate Cookies: This recipe is in my Baking Book and a version is also in my food processor books. I created the recipe as a "prop" to look like ice cream for the restaurant show from the 80's It's A Living. In almost everyone of my chocolate classes I try to put this recipe in.. When I do I sell more books and more chocolate! Sour Cream Cheese Brownies: Rich and yummy Brownies.. A little cheesecake a little chocolate cake.. Both of both worlds. EggNog Nutmeg Cheesecake: Recipe #1 for Holidays! Enjoy! Banana Pound Cake: Most and delicious! I tend to over buy bananas and then black they go! I keep a number of over-ripe bananas in my freezer for times that I just need a banana pound cake or cupcakes. Chocolate Raspberry Truffle Torte:Only a few ingredients! A rich and flavorful flourless Torte.. Great for Passover too! You can replace the raspberries for almonds or any other nut really. White Chocolate Raspberry Cheesecake: This cheesecake is from The Cake Bible. It is a little different from the others as its made with a water bath and lots of sour cream. Enjoy! Blueberry Pie: A sweet pie with a double crust. Bananas Foster: Yes from the famous Brennan's Restaurant on Royal Street in the French Quarter. Chicken Cakes with Dill Mayonnaise: From my 650 Best Food Processor Recipe Book ..If you have extra chicken left over you can make these into wonderful little cakes. Small ones as appetizers or larger ones for a main dish. Peach Salsa: From the 500 Best Sauce Book: A nice and lightly sweet salsa. Peach and Chile Chutney: From the 500 Best Sauce Book: Great on chicken and turkey burgers. Watermelon Salsa: From the 500 Best Sauce Book. A light refreshing dip for summer. Zucchini Pineapple Muffins: I made these on the San Diego Live Show for National Zucchini Day! See the complete show on the show page here!